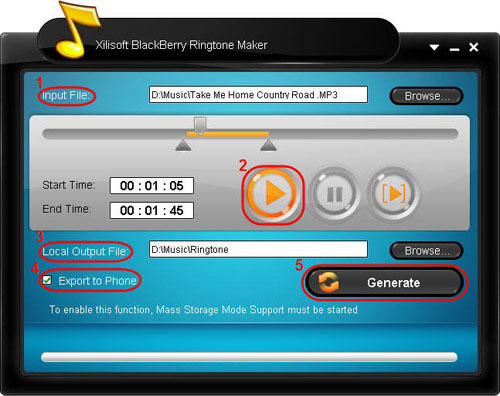 The guide will explain how to easily create your BlackBerry ringtone from any video/audio files. 4. If you want, check "Export to Phone" option to let the program upload the output ringtone to your BlackBerry memory card directly after conversion. 5. After all above are finished, click "Generate" button to start creating your own BlackBerry ringtone. During the creation, you can check the process by the progress bar at the bottom. Just in a few minutes, you make your own BlackBerry ringtone from the loved music.